The Trust for Public Land recently ranked the nation’s largest cities based on the number of dog parks available to their residents. Cincinnati fared well, coming in at #15 with 1.2 dog parks per 100,000 residents (73kb PDF) out of the 75 total cities examined. Dog parks provide dog owners living in the city a spot where they can bring their canine friend to do their business. A secondary, and equally important, role to dog parks is the social component. Dogs and their owners alike often use their trips to the dog park as a way to socialize and interact with other dogs and owners. This social component provides that always desired community feel as people become bonded to their neighbors through shared experiences. In the city, it also puts more “eyes on the street,” and creates a sense of vibrancy that might not be there if the owners kept themselves and their dogs cooped up inside their urban dwelling unit. So while Cincinnati fares well with the overall dog parks per 100,000 residents analysis, it fails in the very neighborhoods that dog parks would provide this dual benefit. Aside from the Pet Athletic Club, there is no dedicated spot for residents of Downtown, Over-the-Rhine or the West End to take their dogs. 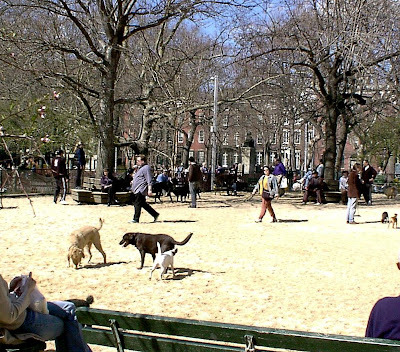 These neighborhoods are the most lacking in private yard space and need these kinds of parks to make urban living possible for the slews of dog owners out there. There is hope though as a dog park is planned for the northern portion of Washington Park as part of its ensuing renovation/expansion. This will be a great asset for the residents of Over-the-Rhine and even those living in the northern parts of Downtown, but how about the many people living in the “Soapbox District” or over near Lytle Park? Well there was a movement that surfaced about as quickly as it went away for a Downtown dog park. City Manager Milton Dohoney got a group of stakeholders together to study the issue with pledged support from the Downtown Residents Council. The effort, however, has been stalled indefinitely as the associated construction and maintenance costs appeared to be too cumbersome. Please share any thoughts or ideas you may have about how to go about implementing a small dog park in Downtown Cincinnati. A donated piece of land, volunteer service and ideas about how to set up some sort of dog park endowment would be especially helpful in developing a dog park.